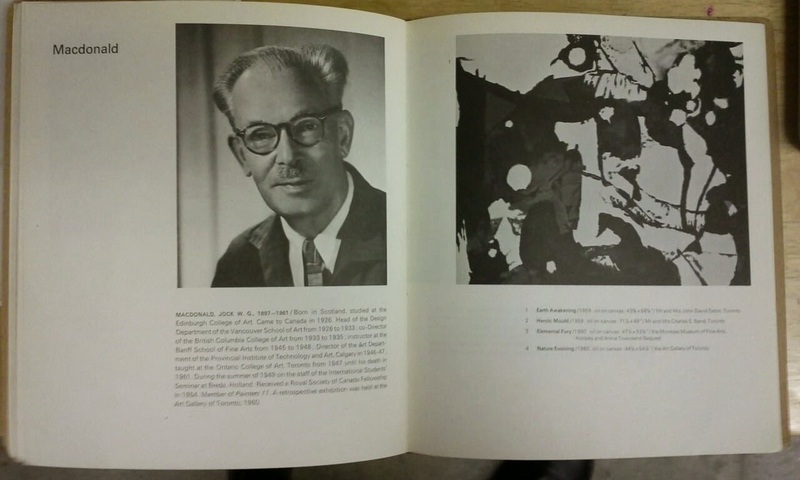 Taken from the catalogue for "Fifteen Canadian Artists", which was a travelling exhibition organized by the Museum of Modern Art "under the auspices of the Museum's International Council". (I have no idea what this statement means exactly.) The exhibition featured the work of Borduas, Bush, Colville, Coughtry, Etrog, Gladstone, Lemieux, Macdonald (obviously), McEwen, McKay, Onley, Pellan, Riopelle, Ronald and Town. The catalogue has essays by Evan H. Turner and William J. Withrow. The introduction is by then MOMA Director, Rene D'Harncourt. Sometimes you find cool things in the OCAD library. Turner's essay on Canadian painting mostly made me puke a bit in my mouth because of it's ultra-Americanized tone. (You know, we're just soooo provincial in this country, except for these here American style painters. Puke.) Anyways, he credits the older Macdonald as being the biggest influence on the development of Toronto painting after 1946. Also, Macdonald has a seriously cool hair cut in this picture. I don't even know how you make hair part like that. Half of his moustache appears to be missing.